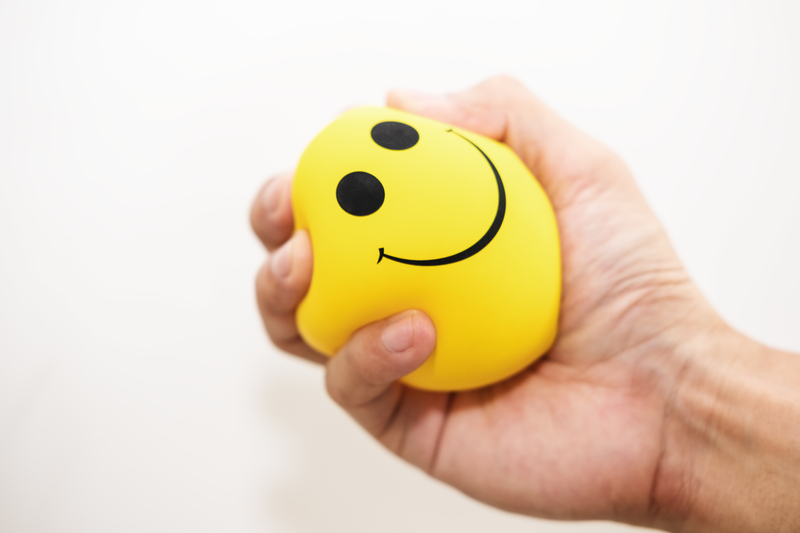 Our bonus stress relief tip, to give you an even dozen: Squeeze the heck out of a stress ball. Stress happens—whether we like it or not. While some strain is essential to our survival (it promotes the release of hormones needed to fight or run from our stressors), too much can cause a slew of nasty illnesses. Being under chronic stress boosts our risk of physical and psychological conditions, including high blood pressure, cardiovascular disease, diabetes, anxiety, depression, and cancer. So stress relief is an important part of life. We hope the 11 strategies below will help you take the edge off. Twenty-seven percent of American adults turn to food to cope with stress, according to the American Psychological Association’s 2017 Stress in America< report. Unfortunately, the foods we crave when we’re tense are bad for us (we’re talking about you, jelly beans and ice cream). When we’re stressed, our bodies tend to store extra fat, so this isn’t the time to be pigging out on high-fat, high-sugar, or high-calorie treats. Next time you’re feeling peckish, reach for a healthy snack. Vegetables like avocadoes are high in disease-fighters like magnesium, potassium, and vitamins A, E, and K. Nuts boast protein, which provides an energy boost, and fruit is chock-full of antioxidant-rich vitamins that can reduce inflammation caused by long-term stress. Exercise is the key to a long, healthy, stress-free life, says pretty much everyone! For years, studies have proven that regular exercise keeps our hearts, lungs, and other organs healthy. Getting fit also boosts our production of mood-enhancing endorphins. Researchers from Duke University found that 30 minutes of brisk exercise (e.g., walking) three times a week is as effective as medication at reducing symptoms of depression. WHAT CAN I DRNK TO RELIEVE STRESS? Drinking tea can help promote stress relief. Green tea, which is high in polyphenols, a natural disease-fighting chemical, also contains L-theanine, an amino acid that can reduce strain. And black tea can speed our recovery from stressful events and stimulate a feeling of relaxation after completing a challenging task, found researchers from the University College London. The way you see the world can affect how well you deal with stress. Plus, thinking positively can improve mood, protect your heart, ward off illnesses, and increase your lifespan, say experts from the Mayo Clinic. While a life-long pessimist won’t become an optimist overnight, there is a silver lining—if you’re willing to put in the work. When things go wrong, try looking at them in a more favorable light. Dinner burned in the oven? That doesn’t mean you’re a terrible cook; it gives you an excuse to order in from a favorite restaurant. Stop thinking the worst, being down on yourself, and expecting disaster to strike. Taking deep breaths can help calm even the most tense people, say researchers. Learning to control your breath by slowing it down and taking deep, concentrated inhales can tell your brain to shut off its alarm signals. A small 2017 study of 38 adults found that deep breathing lowered the subjects’ heart rate and cortisol levels, improving mood and stress. Need breathing tips? Read our post Simple Breathing Exercises Bring Instant Calm. The first step to stress relief is recognizing the cause of your strain. Once you find the root of your angst, replace the worry or anxiety with acknowledgement and understanding of your emotions. Instead of becoming a victim of your stress, get to know its symptoms (e.g., increased heart and breathing rates or tense shoulders) and calm them before they get out of control. Researchers from California found those who were able to articulate and identify their stressers were more relaxed and less stressed than those who weren’t mindful. While it may be tempting to skip a meal when we’re under pressure, doing so can wreak havoc on our health. A primary research study on animals discovered that dieting (in this case, cutting sugar from the diets of animals who were used to overeating it) caused depression and anxiety. Find a comfortable, quiet place to sit. Close your eyes. Then, take deep, slow breaths (fill your lungs and let your belly expand). Pay attention to your breath as you breathe in and out gently and slowly. If you get distracted (by a noise, feeling, or thought), acknowledge it (without judgement), then bring your attention back to your breath to begin again. Fresh air is good for the soul. It can also bust stress. A Japanese study found that those who experienced Shinrin-yoku (taking in the atmosphere of the forest) had lower cortisol levels than those who walked in a city. The result: They felt calmer and more relaxed. Walk the dog, smell the roses, and breathe fresh air for added stress relief. 8. Turn up the tunes. 9. Spend time with friends. Having a strong support system makes everything better, especially when you’re dealing with excess pressure. Good friends and close family members will talk through your worries, help devise solutions, and best of all, make you happier. A study by researchers at San Diego State University found that being affectionate with a romantic partner before encountering a stressful activity reduced heart rate and blood pressure. Time for a date night! 11. Turn off the news. The media is everywhere: at the gym, in the diner, on our phones. Sometimes, this is a good thing—we can find our local weather report with the touch of a button, for instance. Other times, though, this constant stream of sensationalized information can feed into our anxiety, creating more fear and stress. How do we find stress relief and reduce the media’s negative effects on our mental health? By turning it off! Watch (or read) the news once a day only. antioxidant, anxiety, anxiety depression, black tea, blood pressure, brain, breathing exercises, breathing exercises to lower blood pressure, cancer, cardiovascular, cardiovascular disease, chronic stress, cortisol, depression, depression and anxiety, diabetes, diabetes anxiety, endorphins, energy boost, exercise, food, green tea, health, health problems, high blood pressure, how to deal with stress, inflammation, lower blood pressure, magnesium, mental health, mood, music, nuts, overeating, polyphenols, potassium, protein, recovery, reduce inflammation, report, sleep, sleep routine, stay asleep, stress, stress and anxiety, stress relief, stress symptoms, sugar, symptoms of depression, to lower blood pressure, vegetables, vitamins, weather, your lungs.